White ( Off White ) and Silver Cuff Personalized Christmas Stocking With Snowflake Bead Pattern & Silver tassel trim. IF YOU WANT THE EMBROIDERY TO STAND OUT MORE, PLEASE SPECIFY OFF WHITE THREAD. Our default color, for when you do not specify thread color is Antique Silver which blends in with the cuff material. This is by design as we are doing silver on silver look... so if you prefer your embroidered names to stand out more - we suggest "off white thread" for the silver white look, or some people also specify navy blue, burgundy or black and those look nice as well. Measurements : The stocking is a 19.5 inch stocking (measured diagonally from the top hanger loop to the toe) , just perfect size, not to large, not too small. The top is about 8" wide. Materials: Off White polyester based Linen with Metallic Silver Cuff, Metal Beads in Snowflake Pattern and Metal bead tassel. Personalizing is available free of charge. 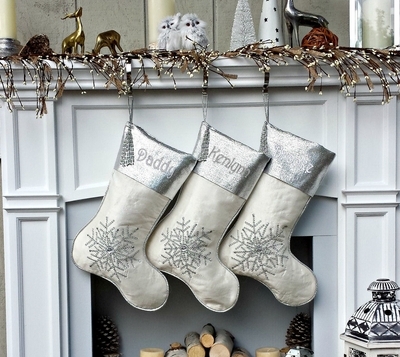 Embroidery in Metallic Silver Thread that slightly contrasts the Stocking but keeps the white silver theme looking good...... The SILVER THREAD is slightly lighter then the cuffs, THE ANTIQUE SILVER THREAD is slightly darker then the cuff, both silver threads are Silver on Silver decor theme so while the names are visible, they will not jump out at you...... If you wanted a thread color that is contrasting a lot, we have a black or burgundy or royal or navy blue.... so you are welcome to request a special thread color on the checkout screen, there is a comments area, we will be happy to make it happen for you.